Google Play has movies, games, TV shows, books you can even look at the news on this app. 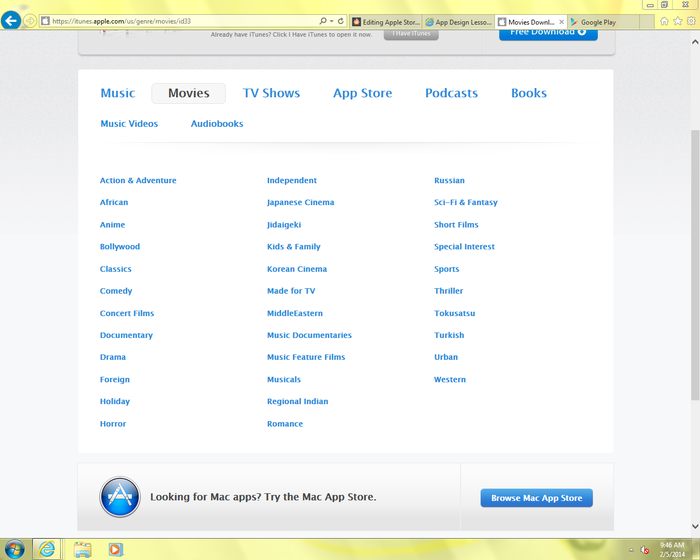 Apple app store has movies, games, TV shows< books just like Google play but Google play may have more of a variety. Apple store there are a lot of apps you do have to pay for but you can also get many for free. For movies you have to pay like $4.99 unless its a newer movie it'll cost more. This page is a picture of the games and how it gives you different topics to pick from and most games are about 1 to 2 dollars. Books there are actually a lot of a variety and its nice if you like to read. 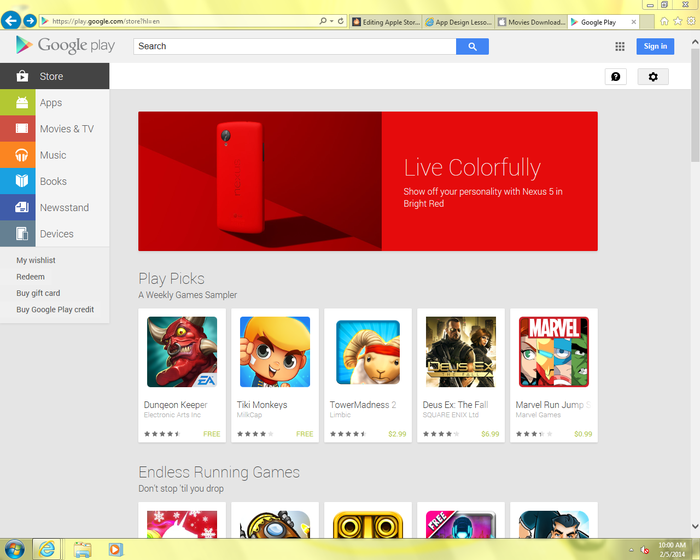 Google play is really the exact same in prices to apple they are very similar with that. You can get a lot for free but there is also a lot that you have to pay for. Newer movies can be up to $15 but then older movies are about $4.99. There are a lot of games that are free but the most they will be is about $2.99. Books you do have to pay for there may be a few that are free but not many they go up to about $10. Music you can download albums or just single songs but the album would be $10.99 maybe more depending on who your looking for. Usually an app will come out for apple first I'm not sure why but the app will eventually go come out on Google play too. So all of the good or the newest and popular apps will come out so people that use Google play cant play or use them. So apple is more up to date with popular apps or they get them first. Apple vs google play who has more apps? I personally think Apple has more apps and a more of a variety then Google play. Google play has a lot but I don't think they have enough or more than apple anyway. Me personally I like apple way better I'm not the biggest fan of Google play because I've always used apple never have I used Google play and I've used apple and never have I had a problem with it. To submit an app to an app store for iTunes its $99 per year. It is the same for Google play too. I think that apple would have more bugs because more people use it as of Google play not as many people use that so its cleaner than apple.